One of the biggest areas that coaches neglect when [tag]coaching youth basketball[/tag] is coming up with fun drills. 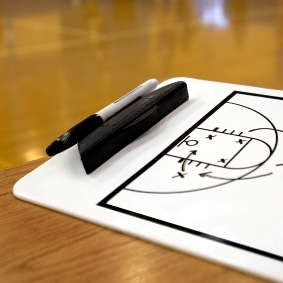 Read below for great suggestions on [tag]fun basketball drills[/tag] for your youth teams. Well, I have something for my young 6-9 year old team which I will do towards the end of [tag]basketball practice[/tag] to get them motivated again. I split them into two even teams and give them numbers 1 through how many players is on each team, keeping the two players who have the same number evenly competitive. Using two [tag]basketball[/tag]s I throw them into play, at the same time calling out a number or numbers. The player who scores first gets a point for their team. I usually make game up to 7 points. If score is tied at 6, I most likely will call out all numbers’ to make it fun and more team like. For my 10-12 year olds, I make it more competitive and have the player/s who number is called make a three-point shot, free-throw, and lay-up. This [tag]basketball drill[/tag] has been one of the more fun drills, but most of my drills for my 12-14 year old team has been pretty much universal drills that most coaches are hip to already, so I actually need to learn something new.